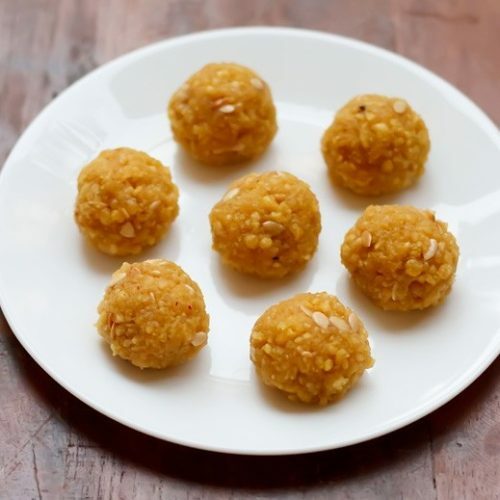 motichoor ke ladoo recipe - melt in the mouth ladoos made from gram flour. one of the most popular indian sweet. dissolve sugar, saffron threads and water in a pan and keep it on the stove top. make a smooth flowing batter of the gram flour/besan, crushed saffron and water. the batter should neither be thick nor thin. it should be a flowing batter without any lumps. the amount of water to be added depends on the quality of the the gram flour. so you can add more or less than what is mentioned in the recipe. heat oil for deep frying in a kadai or pan. the oil has to be moderately hot. take a perforated ladle/spoon. with your hands position the ladle above the oil. you will need one more large ladle/jhara to remove the fried boondis. take a large spoon of the besan batter and pour it on perforated ladle/spoon. press with the other spoon so that the batter falls down from the perforations into the hot oil. fry the boondi (gram flour balls) till they become golden. don't over fry or make them crisp. when the oil stops sizzling, remove the boondis. about 45 seconds to 1 minute is enough to get the correct texture in the boondi. this step is important because if boondi becomes crisp then motichoor ladoos won't be soft and they won't be able to absorb the sugar syrup. for collecting the fried boondi use a large slotted spoon/jhara. drain the oil very well after removing the boondi and then add them directly to the sugar syrup. also note that the sugar syrup should be hot. if the sugar syrup is not hot, then just heat it. in case, the sugar syrup crystallizes, then reheat again. no need to bother about the tailed boondis as we will be pulsing them in the blender later. make all the boondis like this and keep on adding them immediately to the sugar syrup. stir and mix well. the boondis should get softened in the sugar syrup. in a blender or mixer add the boondi and the sugar syrup. add 1 tbsp of hot water and pulse the boondi mixture for a few times to get a smaller shape. don't pulse too much otherwise you won't be able to shape the motichoor ladoos. the amount of water to be added depends on the texture of the boondis. if the boondis are a bit crisp, then add 1 or 2 tbsp more of the hot water. the boondis absorb the hot water and remain soft and moist. add the magaz/melon seeds and black cardamom seeds. mix well. apply some oil or ghee on your palms and shape the motichoor ladoos. the mixture would be warm when preparing the ladoos. on cooling they become firm. you can garnish the motichoor ladoos with melon seeds/magaz or raisins. these motichoor ladoos can also be refrigerated since they are not made from ghee. if you fry them in ghee then the ghee will solidify on refrigeration.